You didn’t start your business because you wanted to be a marketer. But you’ve likely found that it’s a large and frustrating reality of business ownership. Marketing has become extremely complex with literally thousands of places to spend your limited marketing dollars but almost no accountability from the companies with which you spend those dollars. Promio partners with small business owners to eliminate their frustration around marketing and provide real accountability for delivering results. Promio is the only all-in-one local marketing system that GUARANTEES results. It delivers all the marketing essentials — lead generation, lead conversion, customer retention, and reputation management — you need to grow your business in a single, simple system. Plus, its proprietary reporting technology captures EXACTLY how much money you make from each marketing tactic. 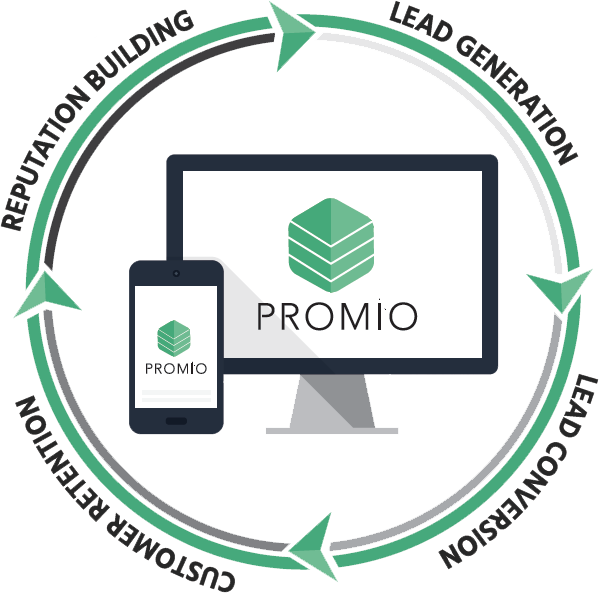 With Promio you get more leads, more customers, and more revenue – guaranteed. Lead Generation System: Locally-optimized digital advertising on the top search and social media websites. Lead Conversion Engine: Fully-automated lead conversion system with a mobile app to manage it all. Customer Retention: Triggered marketing campaigns based on your customer’s buying behaviors. Reputation Management: Customer satisfaction monitoring and online review generation. Save time by having one simple system to manage all of your marketing. See exactly how much money you make from your marketing. Guaranteed results eliminate all your risk.